The Ardeatine massacre, or Fosse Ardeatine massacre (Italian: Eccidio delle Fosse Ardeatine), was a mass killing carried out in Rome on 24 March 1944 by German occupation troops during the Second World War as a reprisal for the Via Rasella attack conducted on the previous day in central Rome against the SS Police Regiment Bozen. Subsequently, the Ardeatine Caves site (Fosse Ardeatine) was declared a Memorial Cemetery and National Monument open daily to visitors. Every year, on the anniversary of the slaughter and in the presence of the senior officials of the Italian Republic, a solemn state commemoration is held at the monument in honour of the fallen. Each year, 335 names are called out, a simple (seemingly endless) roll call of the dead, to reinforce that 335 discrete individuals symbolise a collective entity. In July 1943, the Allies landed on the island of Sicily, preparing to invade the mainland, and Rome was bombed for the first time. On 24 July, the Fascist Grand Council, which the dictator Benito Mussolini had not convened since 1939, met and overwhelmingly voted no confidence in Mussolini. The following day, anxious to extricate his country from an unsustainable war, King Victor Emanuel III, the titular head of the Italian government and Commander-in-Chief of the armed forces under Mussolini, appointed Marshal Pietro Badoglio to head a new military government. He then ordered his gendarmerie, the Carabinieri, to arrest and imprison Mussolini. In August 1943, Rome was bombed again, and the Badoglio government began secret surrender negotiations with the Allies in Sicily, although still outwardly allied to Germany. In accordance with the Pope's wishes, the Italian government also unilaterally declared Rome an open city, i.e., a demilitarized zone, a declaration the Allies would refuse to recognise and the Germans to respect. The Germans, anticipating an Italian defection, meanwhile began moving more and more troops into Italy (Operation Achse). Foreseeing a German invasion, a coalition of Anti-Fascist parties and Monarchists formed the Committee of National Liberation (CLN). On 3 September the Badoglio government signed an unconditional surrender, which U.S. General Eisenhower made public on the eve of the Fifth Army's amphibious landing at Salerno (8 September). At the same time, Badoglio issued the Badoglio Proclamation, directing Italian troops to end hostilities against the Allies but to oppose attacks "from any other quarter". The following day, the German army began moving in on Rome, and that night the King and Badoglio fled the city for Pescara and then to Bari, leaving a leadership vacuum. The Royal Italian Army, although outnumbering the German soldiers three to one, was leaderless, poorly equipped, and in chaos. After a failed resistance at the Pyramid of Cestius by remaining loyalist soldiers, carabinieri (including a school of cadets), and civilians, the Germans occupied Rome. They announced the imposition of German military law with summary execution for violators. Three days later (on 12 September), Nazi commandos tracked down and rescued Mussolini from his hidden prison in the Gran Sasso and set him up in the puppet regime of the so-called "Republic of Salò" in Northern Italy. In October they rounded up and deported the Jews of Rome for extermination at Auschwitz and also made numerous mass roundups of non-Jewish male civilians for forced labor. Meanwhile, General Mark Clark's Fifth Army in Salerno suffered severe setbacks, and General Eisenhower and other Allied leaders began concentrating their attention on the imminent invasion of France, temporarily neglecting Italy. In December, the armed Partisan Resistance began to strike German forces in Rome. The Germans responded with raids carried out by mixed Gestapo and Italian Fascist police militias on Vatican institutions known to be harbouring prominent CNL members and other Anti-Fascists. In January news of the surprise Allied landing behind enemy lines at Anzio (Operation Shingle), only 30 miles from Rome, created temporary euphoria among the Roman populace along with a dangerous relaxation of caution on the part of Resistance members that enabled the Nazis to arrest and torture many of its most important leaders. In the meantime, General Clark's attempt to link up the Fifth Army with the Anzio troops was unsuccessful, as the Anzio forces were held back by a line of German fortifications hastily constructed using forced civilian labour. A body lies in the Via Rasella during the roundup of civilians by Italian soldiers and German troops after the partisan bombing on 23 March 1944. On 23 March 1944, a column of the German 11th Company, 3rd Battalion, SS Police Regiment 'Bozen', was attacked by an ambush of Partisans while marching and singing on a prescribed route that led through the Piazza di Spagna into the narrow street of Via Rasella. Organised by the Nazis to intimidate and suppress the Resistance, the battalion had been raised in October 1943 from ethnic German-speakers of the northern Italian province of South Tyrol, a territory that Hitler had annexed to the German Reich after the September "betrayal" by the Italian government. Many of its citizens had since opted for German citizenship. The soldiers of the battalion were veterans of the Royal Italian Army who had seen action on the Russian Front and had chosen service in the SS rather than face another tour in the East with the Wehrmacht. The attack was carried out by 16 partisans of the Communist-dominated resistance organisation Gruppo d'Azione Patriottica ("Patriotic Action Group") or GAP. An improvised explosive device was prepared consisting of 12 kilogrammes of TNT packed in a steel case. This was inserted into a bag containing an additional six kilograms of TNT and TNT filled iron tubing. Although reported as having been thrown from a building, the bomb had actually been hidden in a rubbish cart, pushed into position by a Partisan disguised as a street cleaner, while others acted as lookouts. The fuse was lit when the police were forty seconds from the bomb. The blast caused the immediate deaths of 28 SS policemen and may have killed two civilian bystanders, one of whom, Piero Zuccheretti, was an eleven-year-old boy, although he might have been killed by the Germans firing in response; it is unknown. More would die over the next few days. All sixteen Partisans—some of whom fired on the German column—succeeded in melting away into the crowd unscathed. German troops and Italian collaborators round-up of civilians in front of the Palazzo Barberini, Rome, in March 1944. The German police attaché and commander of the Security Police in Rome, SS Obersturmbannführer Herbert Kappler was on the scene soon afterwards to supervise the investigation. That evening he was summoned to the headquarters of the German Armed Forces Commandant in Rome, Luftwaffe Generalmajor Kurt Mälzer, who had decided that the killings called for reprisals. They agreed that the execution of ten Italians for each German policeman killed was a suitable ratio. Mälzer, who also proposed burning down part of Rome, passed this on to General Eberhard von Mackensen, the commander of the Fourteenth Army, whose jurisdiction included Rome. General Mackensen endorsed the recommendation. In turn, the staff of the German Commander-in-Chief South (Oberbefehlshaber Süd), passed this on to the Oberkommando der Wehrmacht (OKW). That night, Adolf Hitler authorised the reprisal, stipulating that it be carried out within 24 hours. Commander-in-Chief South Generalfeldmarschall Albert Kesselring, considered this an order, one he interpreted as calling for the execution of Italians who had been previously sentenced to death. He was assured by Kappler that sufficient prisoners were available. However, Kappler had only four prisoners sentenced to death in his Hausgefängnis (private prison) at SS headquarters in the German Embassy on 145 Via Tasso (now the Museum of the Liberation of Rome); plus 17 serving long sentences; 167 deemed "worthy of death"; and two to four civilians who had been rounded up in the Via Rasella area on suspicion of involvement. Kappler's superior, SS Brigadeführer und Generalmajor der Polizei Wilhelm Harster, suggested making up the numbers from the 57 Jews also in Nazi custody. By noon on 24 March, Kappler had a list of 271 victims, each with his crime listed against his name, except for the Jews, simply listed as "Jew". By this time the death toll from the Via Rasella bombing had risen to 32. (One more would die while the reprisal was under way; the death toll eventually reaching 33.) To make up the numbers, Questore Pietro Caruso, chief of the Fascist police in Rome, offered some Italians from his Regina Coeli prison, one of whom, Maurizio Giglio, had been one of his own Lieutenants, before being unmasked as a double agent working for the American OSS in charge of radio communications with the Fifth Army. Because of the time limit that Hitler had imposed, Mälzer and Kappler agreed that the victims would have to be shot in the back of the head at close range rather than by conventional firing squad. The men of the regiment Bozen, the unit which was hit in the attack, were offered to avenge their comrades but they refused to do it in that way. The massacre was perpetrated without prior public notice in a little-frequented rural suburb of the city, inside the tunnels of the disused quarries of pozzolana, near the Via Ardeatina. By mistake, a total of 335 Italian prisoners were taken, five in excess of the 330 called for. On 24 March, led by SS officers Erich Priebke and Karl Hass, they were transported to the Ardeatine caves in truckloads and then, in groups of five, put to death inside the caves. Because the killing squad mostly consisted of officers who had never killed before, Kappler had ordered several cases of cognac delivered to the caves to calm the officers' nerves. The officers were ordered to lead the doomed prisoners into the caves with their hands tied behind their backs and then have them kneel down so that the soldiers could place a bullet directly into the cerebellum, ensuring that no more than one bullet would be needed per prisoner. Many were forced to kneel down over the bodies of those who had been killed before them because the cave had become filled with dead bodies. During the killings, the existence of the five extra prisoners was discovered, and it was decided to kill them anyway, in order to prevent news of the location of the place of execution from becoming known. A German officer, named Amon, testified at Kappler's trial, which took place in Italy in 1948; claiming that once he entered the cave and saw the piles of dead bodies, he fainted and was replaced by a comrade who pushed him aside and shot another victim. The bodies of the victims were placed in piles, typically about a metre in height, and then buried under tons of rock debris when German military engineers set explosives to seal the caves and hide the atrocity. They remained summarily buried and abandoned for over a year inside the caves. Families of the victims were notified with excruciating slowness by individual letter, if at all, a strategy of cover-up and concealment – "Night and Fog" – designed to confuse, grieve, and intimidate surviving relatives, according to Robert Katz. Only after Rome was liberated by the Allies on 4 June 1944, were the bodies finally found, by Armando Della Valle and another fireman who were sent to search in the caves after a tip off, exhumed, and at last given proper burial. Misconceptions about the Fosse Ardeatine Massacre abound. Foremost among these is the notion that the Partisans responsible for the Via Rasella attack were ordered to come forward and turn themselves in to the SS and wilfully declined to do so. Although it is sometimes claimed that the reprisal victims were predominantly Jewish, only 75 of the 335 victims selected for death in the caves were Jewish, this having been a criterion for selection (because Jews were known to be marked for death anyway). In fact, the victims comprised, in [Robert Katz]'s words, "rich, and poor, doctors and lawyers, workers and shopkeepers, artists and artisans, teachers and students, men and teenage boys from every walk of life, and even a man of God to walk among them". The main concern of the SS had been speedy fulfilment of the quota. Some were residents of Via Rasella who were home at the time of the Partisan attack; others had been arrested and tortured for suspected Resistance and other anti-Fascist activities, while still others had been casually picked up on the streets or arrested at their homes on the basis of tips from Fascist informants. The youngest of them was 15 years old. Political prisoners included members of the GAP, the PA, and the Monarchist Clandestine Military Front of the Resistance (FMRC), which included many policemen. Members of the Bandiera Rossa ("Red Flag") a dissident Communist Resistance group, constituted the largest group. 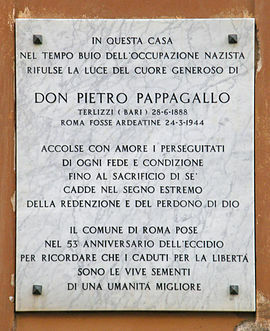 One political prisoner, Padre Pietro Pappagallo, was one of the models for the character of Padre Pietro in Roberto Rossellini's pioneering neo-realist film Rome, Open City, filmed in 1944. Another, perhaps the most celebrated, was the aristocratic Colonel Giuseppe Montezemolo (age 44), who, after the flight of the King and Badoglio, had elected to stay and go underground in Rome, disguised in mufti as a professor or Ingegnere (engineer), to organize and lead the FMRC, representing the Badoglio Government, with which he had been in continual radio contact up until his arrest on 25 January 1944. Colonel Giuseppe Montezemolo's incredible courage under torture that included having his nails and teeth pulled out, became legendary. Another was General Simone Simoni (it), a war hero aged 64, who had endured torture with a blowtorch. The old soldier had replied to his captors, "My only regret is that I was not younger because there was so much more I could have done [for my country]". Neither man ever talked or in any way betrayed their network. Adolf Hitler, died in Berlin, 1945. WE WERE SLAUGHTERED IN THIS PLACE BECAUSE – WE FOUGHT AGAINST INTERNAL TYRANNY – FOR FREEDOM AND AGAINST THE FOREIGNER – FOR THE INDEPENDENCE OF THE HOMELAND – WE DREAMT A FREE, JUST – AND DEMOCRATIC ITALY. MAY OUR SACRIFICE AND OUR BLOOD – SOW THE SEED AND ACT AS WARNING FOR – GENERATIONS TO COME. HERE WE WERE SLAUGHTERED – VICTIMS OF A HORRENDOUS SACRIFICE – MAY OUR SACRIFICE GIVE RISE TO A BETTER HOMELAND – AND TO LASTING PEACE AMONG THE PEOPLES. FROM THE DEPTHS, I HAVE CRIED OUT TO YOU, O LORD. For a number of reasons, including (but not limited to): the large number of victims; the fact that many of them were innocent civilians casually taken only to make up the number of those to be killed; the cruel methods implemented (even by Nazi standards) to carry out the massacre; the fact that the reprisal order had come directly from Adolf Hitler, and the hiding of the bodies, which were buried summarily instead of being returned to their families, the slaughter became a symbol of the various massacres carried out against civilians in Italy from 8 September 1943 until the German surrender on 8 May 1945. In December 2007, Giorgio Bettio, a city councillor of Treviso, Italy and member of the Northern League party, suggested that "With immigrants, we should use the same system the SS used, punish 10 of them for every slight against one of our citizens" in reference to Italy's current debate over immigration policies. This comment was met with public condemnation, and Bettio later said, "I certainly made a mistake in citing the SS." He claimed the incident had been "sensationalized" by the media. The Vatican's role in the massacre came under particular scrutiny following the publication of Robert Katz's first book, Death in Rome (1967), in which he speculated that Pope Pius XII had advance knowledge of the Nazi orders and did little to forestall it. This was vigorously disputed by the Pope's defenders. In an update to his book, Katz cited a document released by the Vatican in 1980 – a message dated 25 March to the Papal Secretariat from an engineer called Ferrero warning of imminent bloody reprisals – in support of his claim. According to Katz, the Vatican has yet to release exonerating documentation, if any exist. Katz elaborated on this in 2003 in The Battle for Rome: The Germans, The Allies, The Partisans, and The Pope, September 1943 – June 1944, using evidence from recently released OSS and Vatican sources that certain German diplomats, notably Eugen Dollmann, Himmler's representative in Rome and German Consul Eitel Möllhausen had gone to Pope Pius' personal liaison to the German occupational authorities, Pankratius Pfeiffer, asking him to urge the Pope to intervene and limit reprisals on the grounds that they would inflame the Roman population and make the occupation (and negotiations for a separate peace with the Allies they all fervently wished for) even more difficult. In the aftermath of the massacre, Pope Pius XII debated whether to protest against the massacre but decided not to because, as one of his defenders reported, "all the convents, all the religious houses of Rome were full of refugees, Communists, Jews, democrats and anti-Fascists, ex-generals, etc. Pius XII had even suspended the rules for the cloister. If Pius XII had made a public protest, there would have been searches in all these houses and catastrophe would have ensued". Instead, a special editorial entitled "The Deeds in Via Rasella" appeared in the "semi-official" Vatican newspaper, the Osservatore Romano, deploring the violence of "the guilty parties who escaped arrest" (presumably the Partisans, however Stephen Walker in his book Hide and Seek writes that "the wording is worthy of examination" and speculates that this is a reference to "the Nazis who rounded up over 300 people and then butchered them.") and urging Roman citizens to continue to exercise restraint to prevent further sacrifices of innocent people. "In the face of such deeds every honest heart is left profoundly grieved in the name of humanity and Christian sentiment. Thirty-two victims on the one hand, and on the other, three-hundred-and-twenty persons sacrificed for the guilty parties who escaped arrest." Subsequently, the Nazi Occupation forces stepped up their hunt among Roman civilians for suspected Resistance supporters, whom it rounded up and tortured. In 1952, the new Italian Supreme Court declared the Via Rasella attack to have been a legitimate act of war after an appeal by Kappler's lawyers of his conviction of guilt in the Ardeatine Massacre. This decision was reaffirmed in 1999, when the Italian Supreme Court declared the Partisans immune from prosecution after a Roman prosecutor had unsuccessfully attempted to bring a suit against them for the death of the boy Piero Zuccheretti, who had been killed in Via Rasella. Historian Robert Wolfe finds "persuasive" Katz's characterisation of the Pope's decision to condemn the Partisans for the Via Rasella attack, rather than the Nazis for the reprisals, as evidence of "a moral failure" resulting from one of the "great misreadings of history". In the 1990s, there was a revisionist campaign by Il Giornale, a newspaper owned by Paolo Berlusconi, brother of former Prime Minister Silvio Berlusconi, to re-label the World War II Partisans responsible for the attack on Via Rasella as "terrorists". In response, the Italian Supreme Court of Cassation officially ruled that the act in Via Rasella had been a legitimate act of war and not a terrorist attack and ordered the publisher to pay punitive damages of 45 thousand euro. Nevertheless, some historians, such as Richard Raiber and István Deák, continue to imply that the Partisans were the equivalent of terrorists and were, moreover, responsible for avoidable suffering, thus offering some support for the official judgment of the Vatican at the time. Historian Patrick Gallo, however, in For Love and Country: The Italian Resistance (2003), posited that the Rome-based Resistance not only undermined German morale but also achieved important strategic objectives and was hence not a useless provocation, as contended by critics, but an act of legitimate military significance in furthering the Allied victory. Reviewing Katz's book, The Battle for Rome, István Deák, on the other hand, cautions that although "armed resistance during World War II was romanticised because the Nazis were such an appalling enemy, and because in that war the guerrillas' targets were still mainly soldiers", it is increasingly hard to draw the line between freedom fighting and terrorism. In his opinion, Hague Conventions regulating irregular warfare has been "more a failure than success." "What is needed," Deák stresses, "is a recognition of reality, namely that future wars will increasingly consist of civilians shooting at soldiers from hiding and frightened soldiers killing innocent civilians. And what is needed, in the aftermath of such a sobering recognition, is an attempt to create a new international law for the more efficient regulation of this type of horrible warfare." Robert Katz's book, The Battle for Rome, Deák concludes, "provides fine arguments for this necessary debate". Immediately after the war Roman Partisan leaders, including Rosario Bentivegna, the medical student who had set off the Via Rasella bomb, were recipients of medals conferred by the post-war Italian government. Both Priebke and Kappler sought Vatican assistance after the war. Priebke escaped from a British prison camp in 1946 and fled, first to the Tyrol and then back to Rome, whence, using false papers supplied by the Vatican "ratline", he emigrated to Argentina. He was unmasked on camera in 1994 during a television interview by ABC television reporter Sam Donaldson, brought back to Italy for trial, and sentenced to house arrest in the home of his lawyer, Paolo Giachini. He died on 11 October 2013 from natural causes at age 100. His last request to have his remains returned to Argentina to be buried alongside his wife was denied by Argentina. The Vatican issued an "unprecedented ban" on holding the funeral in any Catholic church in Rome. But the Society of St Pius X, a Catholic splinter group often accused of having far-right and anti-Semitic leanings, offered to hold the ceremony in the city of Albano Laziale. During the funeral service, violent clashes broke out between fascist sympathisers and anti-fascist protesters. Don Florian Abrahamowicz, a priest expelled from the Society of St Pius X for his extreme right-wing views, told Italy's Radio 24: "Priebke was a friend of mine, a Christian, a faithful soldier." Kappler, a Protestant until his late conversion in life, unsuccessfully sought asylum within the Vatican. Tried by the British and sentenced to life imprisonment in Rimini, in 1977 he successfully escaped from a Roman military hospital where he had been undergoing treatment for cancer. He died unmolested the following year at his home in Soltau, West Germany, the West Germans having refused Italian requests to extradite him. The event was recreated in the 1962 film Dieci italiani per un tedesco (Via Rasella) (Ten Italians for One German (Rasella Street)) directed by Filippo Walter Ratti and starring Gino Cervi. In 1973, the feature film Massacre in Rome by George Pan Cosmatos was released starring Marcello Mastroianni and Richard Burton. American composer William Schuman subtitled his Ninth Symphony, from 1968, "Le fosse Ardeatine" ("The Ardeatine Caves") in memory of the victims. The 2017 novel entitled From Sand and Ash by Amy Harmon details a fictional account of the massacre. ^ Fosse (plural of fossa – "ditch"), is the Italian word used for "mass gravesite". ^ Katz 2003, p. 349. ^ For a discussion of the role played by South Tyrol in the aftermath of the war, see Gerald Steinacher's Nazis on the Run (Oxford University Press, 2012) and Robert Knight, "Not Quite Divine Providence", Times Literary Supplement, 6 January 2012, p. 10. ^ Raiber 2008, p. 41. ^ Katz, Robert. "Death in Rome: The Life and Times of a Book". Robert Katz's History of Modern Italy. Archived from the original on 18 February 2013. Retrieved 24 November 2014. ^ Raiber 2008, pp. 42–3. ^ Raiber 2008, pp. 52–3. ^ Raiber 2008, p. 45. ^ Code named "Cervo", Giglio, from a prominent Roman family, had been subjected to horrific torture, see Katz (2003), p. XVI and passim. ^ Raiber 2008, p. 81. ^ a b Jewish Virtual Library, Priebke file. ^ Trial against Herbert Kappler and others for the Ardeatine Massacre, 12 June 1948 hearing. ^ See "Night and Fog Decree", Document retrieved from the archives of the Avalon Project at the Yale Law School, on website, A Teacher' Guide to the Holocaust, fcit.usf.edu; "Nacht und Nebel", German for "Night and Fog" (a direct reference to a "Tarnhelm" spell, from Wagner's Rheingold) was a directive (German: Erlass) from Hitler on 7 December 1941 that was originally intended to winnow out all political activists and resistance "helpers", “anyone endangering German security” ("die deutsche Sicherheit gefährden") throughout Nazi Germany's occupied territories. . . The decree was meant to intimidate local populations into submission by denying friends and families of the missing any knowledge of their whereabouts or their fate. The International Military Tribunal at Nuremberg held that the disappearances committed as part of the Nacht und Nebel program were war crimes which violated both the Hague Conventions and customary international law. ^ For example, see Alessandro Portelli, in Katharine Hodgkin and Susannah Radstone, editors, Memory, History, Nation: Contested Pasts (Transaction Publishers, 2005), p. 30. ^ For example, Groliers Encyclopedia Americana, Volume 23, (1993), p. 699 erroneously states that the Ardeatine victims were "mostly Jews". ^ Katz 2003, p. 240. ^ The FMCR operated under the directive of "war against the German and the maintenance of public order", see Katz 2003, p. 145. ^ See German wikipedia entry on Giuseppe Cordero Lanza di Montezemolo and Katz 2003, p. 157. In March 2011, on the eve of Pope's visit to the monument commemorating the massacre, Colonel Montezemolo's son, Cardinal Andrea Cordero Lanza di Montezemolo (born 1925), told interviewer Giampolo Mattei of the Osservatore Romano: "This is a memorial that brings everyone into agreement: Christians and Jews, believers and non-believers. The memorial conveys the sense of brotherhood even in death. There has only been reciprocal respect, and never any room for vengeful thoughts or religious conflict. Memorial events have been organized without any problem, in full solidarity and collaboration. Death really brought diverse people together and made even the living brothers. I remember that during the recovery and identification process, a Catholic priest as well as a rabbi were with us to give the blessings. ^ Marcello, Flavia (2017). "Rome remembers fascism: The monument to the Fosse Ardeatine massacre as immersive historical experience". Rethinking History. 21: 67–90. doi:10.1080/13642529.2016.1270566. ^ "Italy politician urges Nazi policies for immigrants". Reuters. 5 December 2007. Retrieved 5 December 2007. .
^ Born, like Father Pankratius, in Bavaria, S.S. Standartenfürer Eugen Dollmann later worked as a spy for the CIA and was interviewed extensively by Katz. According to Wolfe 2005, p. 329, "Dollman was undoubtedly a rogue, a wastrel, and a former S.S. officer, but he was neither a brute nor a killer". ^ German Consul Eitel Möllhausen was the ranking German diplomat in Rome. He lobbied strenuously and courageously but vainly against the deportation of the Roman Jews. See Breitman, et al. (2005), p. 80. ^ Katz 2003, p. 382: "Whether the Vatican first learned of a looming reprisal from Father Pankratius Pfeiffer on the night of the 23rd or from Ferrero, the official of the Governatorio, the following morning, seems only marginally relevant now, but, as already noted, until the 1980 release of the Vatican document by which it was informed that a ten-for-one reprisal was foreseen, it had maintained having no knowledge whatsoever of a German retaliation plan." ^ a b Katz 2003, p. 242. ^ Pius XII and the Holocaust (1988). By Joseph Lichten (writing under the auspices of the Anti-Defamation League) in "Via Rasella and the Fosse Ardeatine" (chapter). ^ Cardinal Tarcisio Bertone, S.D.B., Vatican Secretary of State, Hitler's Pope? A Judgment Historically Unsustainable: A look past exploitative polemics to the greatness of the man Eugenio Pacelli, Secretary of State and Roman Pontiff (speech), reproduced in the Osservatore Romano weekly edition in English (19 November 2008), p. 11. ^ Katz 2003, p. 268, calls this a "perverse declaration of good and evil". ^ Katz (2005), n. 31, p. 390. ^ Wolfe 2005, pp. 329–30. ^ See Via Rasella: the truth and the liar. Silvio Berlusconi's election in 1994 was the motivation for Alessandro Portelli to write his seminal 1999 work, L'ordine è stato eseguito [The Order Has Been Carried Out] (Portelli 2003, p. 15). Portelli 2005, p. 28, decries the continuing denial of the nature of the massacre in the following terms: "We are up against something that is close to a mythical, semi-religious belief in the guilt of the partisans and in the innocence of the Nazis. I think this is an amazing situation. Italy is probably the only country in the world that goes to the length of lying to itself in order to absolve its occupiers and massacrers." ^ For a review of Raiber's book see the History Network website. For Deàk see István Deák, "Resistance", The New Republic, 22 March 2004, and infra. ^ Patrick Gallo, For Love and Country: The Italian Resistance, Lanham, Md., University Press of America, 2003. ^ István Deák, "Resistance", The New Republic, 22 March 2004. ^ a b c "Nazi war criminal Priebke's funeral halted amid protests", BBC News, 16 October 2013. ^ "Dieci italiani per un tedesco (Via Rasella)". IMDb. Retrieved 18 December 2012. Baratter, Lorenzo (2003). Dall'Alpenvorland a via Rasella. Trento: Publilux. ——— (2006). Le Dolomiti del Terzo Reich. Milano: Ugo Mursia Editore. Gallo, Patrick (2003). For Love and Country: The Italian Resistance. Lanham, MD: University Press of America. Katz, Robert (1967). Death in Rome. New York, NY: Macmillan. ——— (2003). The Battle for Rome: The Germans, The Allies, The Partisans, and The Pope, September 1943 – June 1944. New York, NY: Simon & Schuster. ISBN 978-0-743-21642-5. Marcello, Flavia (2017). "Rome remembers fascism: The monument to the Fosse Ardeatine massacre as immersive historical experience". Rethinking History. 21: 67–90. doi:10.1080/13642529.2016.1270566. Portelli, Alessandro (2003). The Order Has Been Carried Out: History, Memory, and Meaning of a Nazi Massacre in Rome. New York, NY: Palgrave Macmillan. ISBN 978-1-403-96208-9. Portelli, Alessandro (2005). "Response to Commentaries". Oral History Review. 32: 27–33. doi:10.1525/ohr.2005.32.1.27. Raiber, Richard (2008). Anatomy of Perjury: Field Marshal Albert Kesselring, Via Rasella, and the GINNY mission. Newark: University of Delaware Press. ISBN 978-0-874-13994-5. Simonetti, Fabio (2016). Via Tasso: Quartier generale e carcere tedesco durante l'occupazione di Roma. Rome: Odradek. ISBN 978-88-96487-55-6. Wolfe, Robert (2005). "Coddling a Nazi Turncoat". In Richard Breitman; Norman J. W. Goda; Timothy Naftali; Robert Wolfe (eds.). U.S. Intelligence and the Nazis. Cambridge: Cambridge University Press. pp. 317–336. ISBN 978-0-521-85268-5. MacLeod, W (1946). "The Massacre of the Ardeatine Caves: Identification of the Dead". Journal of the Royal Army Medical Corps. 87: 10–24. doi:10.1136/jramc-87-01-02. PMID 20996328. Wikimedia Commons has media related to Ardeatine massacre. The main article for this category is Axis war crimes in Italy. This page was last edited on 24 March 2019, at 13:19 (UTC).